In the midst of more fan protests, Arsene Wenger’s side were behind on two occasions but rallied to pick up a point. ARSENAL EARNED BELEAGUERED manager Arsene Wenger a measure of respite by twice hitting back to hold Manchester City to a 2-2 draw at the Emirates Stadium. Pep Guardiola twice saw his City side go ahead, through Leroy Sane and then Sergio Aguero, but Arsenal twice responded via goals from Theo Walcott and Shkodran Mustafi. Victory would have been a welcome tonic for Wenger, who has come in for heavy criticism from Arsenal’s fans, but after four defeats in five Premier League games, the point was welcome. His side remain seven points below City, who occupy the fourth and final Champions League berth, in sixth place, but they retain a game in hand on them. City were prevented from reclaiming third place from Liverpool and eating into Chelsea’s advantage following the leaders’ shock 2-1 defeat at home to Crystal Palace. But City, who have now drawn their last three league games, will have an opportunity to close to within eight points of the summit when they travel to Chelsea on Wednesday. Wenger again faced protests from some Arsenal fans, this time in the form of an advertising van parked outside the ground and leaflets about the launch of a #NoNewContract social media campaign. City’s team featured the novelty of Jesus Navas at right-back, but there was nothing new about the huge boulevards of space they found between the members of Arsenal’s back four. It took City less than five minutes to draw blood as Kevin De Bruyne’s hopeful pass from deep inside his own half sent Sane scampering clear. The Germany winger outpaced Hector Bellerin and skipped past David Ospina — deputising in goal for the injured Petr Cech — before rolling in his eighth City goal. When De Bruyne bent a low shot against the post and David Silva forced Ospina to parry with the rebound, Arsenal looked set for a long afternoon. They worked a foothold, however, with Mesut Ozil putting a tame shot straight at Willy Caballero, Nacho Monreal lashing over from a corner and Alexis Sanchez curling centimetres wide. It took a last-ditch sliding challenge from Fernandinho, meanwhile, to prevent Sanchez applying the finishing touch to Ozil’s flick. 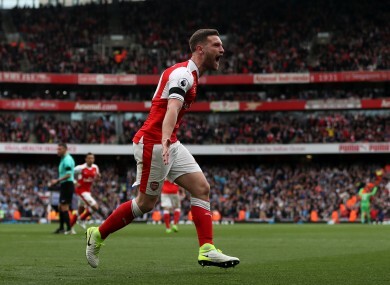 Wenger’s men equalised in the 40th minute when Gael Clichy played Walcott onside from Mustafi’s header and the England man bundled a shot past Caballero. But in testament to Arsenal’s recent travails, parity would exist for just 131 seconds. De Bruyne’s dart into the box was halted by the sliding Laurent Koscielny, but Silva collected the loose ball and laid it off to Aguero, who crashed a low, angled drive beneath Ospina. Koscielny was forced off by injury at the break, with Gabriel taking his place, while Guardiola tightened things up by introducing Yaya Toure for Raheem Sterling and moving De Bruyne out to the right. Arsenal had threatened in first-half stoppage time, Walcott stabbing over from Sanchez’s pass, and eight minutes into the second half they levelled when Mustafi rose to head in Ozil’s corner. While Wenger sent on Olivier Giroud and Alex Iwobi for Walcott and Danny Welbeck in search of a third goal, it was City who came closest to finding a winner. Ospina was obliged to save from a booming Fernandinho drive and a header by Aguero, who had also headed wide from Navas’s cross moments before Walcott’s equaliser. City wanted a penalty in stoppage time after the ball brushed Monreal’s arm as he attempted a stooping header, but referee Andre Marriner said no. Email “Arsenal show much-needed grit and fight to come back and force a draw with Man City”. Feedback on “Arsenal show much-needed grit and fight to come back and force a draw with Man City”.